After the relative success of last weekend I had in my mind that today maybe I could do a bit better than be pack fodder in a Nat b race. This weekend in May each region (I am SE) has its championships, which are all 85-90 mile road races open to e123 riders. Ours is usually hosted on the Edenbridge course which I’ve not ridden but I think from speaking to people it may have suited me better than the one we eventually raced on. Due to roadworks our race was moved over to a circuit in Challock, Kent, the exact same circuit in fact that the road stage of the Toachim GP was run on. So at least I knew what it was like. A long circuit with a long drag and a very quick downhill. However upon arriving we were told that we were to do 3 smaller laps which involved doing the finish hill 3 times. The finish hill is a fairly long drag, around 6% average, has a steep bit near the bottom and shallows a bit near the top, its not the worst hill, but it is 1.5 miles long, and upon hearing this my heart sank a bit as I knew deep down that I wouldn’t be able to stick with the smaller guys up something like that. But still, I’d come all this way, and was keen to race so put it to the back of my mind. There were 4 of us from KW today, all Andy’s (Lack, Edwards, and Snook), so at least we would have a presence. The main team that were there in strength were that of Fleet bike shop PedalHeaven, who have a strong roster of riders, including Jake Martin who had been very strong recently, Francis Cade who used to ride with KW who was also going well, and a fair few others that are all strong riders (8 in total) so it seemed reasonable to assume that the race would be animated by them. We got off to a start and the first time down the steep hill was a little sketchy with the smell of burning rubber and the sights of nervous cornering took hold. I obviously was au-fait with the hill so was quite comfortable, I was actually only telling Andy Lack in the park the previous day that people got dropped on the downhill last year, that is how quick it is. We did a lap and I was trying to keep and eye out for what was going on. Sure enough not long later, and I do mean in the first 20 miles a few guys got away, PH mostly, then one of the strong Felt guys joined, and I saw it going off up the road, I genuinely thought it was quite early and waited to follow the next wheel that went, none went, it was soon pretty clear that was the selection made, early doors. I was pretty annoyed with myself for not being more mindful and having the guts to just go with a wheel and get over to it. Anyway, our group was still pretty large and a lot of teams were still in the group that had nobody up the road, so I was hopeful that maybe something may go of note a little later. We rolled around, and it was clear that nothing was going to be let go, a few attacks went, and eventually were caught, thankfully this time I had plenty of gels with me (after struggling through with 1 last time on this circuit!) so was biding my time, after a few other attempts to get away on the big circuit, once where I followed Will Pratt but again it wasn’t allowed to go anywhere. Then again on the last time round Andy Edwards attacked to get over to a move, that came back then another went over the top that I went with, looked good but once more was brought back. So we all just sat in and waited for the 3 small laps (around 15 mins long) up the hill, as it would be sure to split it. Approaching the hill for the first time there was a small group that had gone up the road, we let them dangle a bit, and hit the hill for the first time, Andy again tried something but it wasn’t to be, he made the pace a bit hot but not enough to split it apart, just yet. The pace up the hill felt pretty quick (though upon further inspection, the front group went up 30 secs faster!!) and I was digging hard to stick with the little guys up the front, and then I attacked over the top to get over to the front group that was looking promising. I got over on the fast downhill and we had a gap, it looked decent for a while but again it was reeled back in. The second time up the hill it was much more sedate, but you could see it had been thinned out a fair bit. Again one or two people went, but I was in no mood to follow and the hill was killing people when they were solo. Up the hill for the final time was much like the first, pace quite high, it was difficult for me, every time I glanced down power was always 400+ which I know is hard work after 85 miles, I stayed near the front and slowly people fell back, it was whittled down to a bunch of maybe 6 with a couple of hundred to go. I actually thought that we were racing for 20th or something so was only really putting effort in for training purposes, so as we came to the line I was right near the front and people started sprinting, I wasn’t interested in sprinting for 20th so just rolled in 3rd or 4th wheel. It was then I learned that the prestigious 14th was up for grabs 😉 and I’d rolled in 19th, had I known that I might have tried to challenge Liam from Twickers who did a good job to take 14th, I think he and I were noticeably the only bigger guys who had managed to stay at the front on the hill. A good day on the bike as the weather was good and I learned plenty, but I must be more vigilant, and I suppose gutsy, there is nothing to lose by getting in the break, as Andy said, if you blow up, so be it, but at least you were there. I feel I have/had the legs to be up there for the main part of the day, and felt a bit stupid for not making an effort to get over early on. Couple more races now, Hillingdon, then the East London Velo race which I favoured over the SERRL 3 day, mainly because it was £80 and I actually fancied a bit of time to myself this bank hols, so hopefully the East London race will be good, a strong field of 2nd cat riders should make for a good race. Back to the Surrey League to see if I could get a result the day after the Milburys win. I made sure to stretch and get on the roller to try and make sure I made the best of what were always going to be tired legs. And actually on Sunday morning they didn’t feel too bad, it was only a short drive down the A3 to Elstead so it wasn’t such a hardship to race again. Today was going to be a hybrid course that had a bit of the Cutmill circuit and a bit of the Runfold circuit, either way it was going to be a tough day out. I got there early to the great news that Gareth Thomas of KW had won the 3rds race in the morning, he will be a 2nd cat pretty soon, so looking forward to having him racing with me as he’s a strong rider who knows what he is doing. He said the surface was a bit poor in parts, and that there were a couple of tasty potholes. The weather at this point was lovely, but sadly the forecast was saying it would turn from sunny skies to pouring rain during our race. After cleaning the bike from the Milburys I really wasn’t filled with joy at this prospect. There were a few strong guys racing, notably from Dynamo, with an on form Mike Debney, Chris Morrison who I’d been told was a strong guy, James Local who is always strong, and certainly a lot of riders from Meudon who were always trying to animate the races. Also Paragon, and Dulwich, Phoenix had a presence. We got going and it was clear this course was indeed harder than Cutmill, and also that my legs were going to get battered all day! I was keen to watch a few riders as I knew they would likely be the ones making the move, and a couple of early moves did go, one of which looked promising with all the main guys in, but was brought back. The circuit had a lot of fast downhills which meant getting away was tough. At some point a couple of guys chipped off the front, Chris from Dynamo and another chap, I didn’t think much of it as it didn’t seem to be a circuit that would suit a small break, especially as there were so many riders really pushing the pace up the hills. The race was quite fast and only had small places to rest before it was another hill, or another sharp turn that was sprinted out of. I actually didn’t realise until fairly late on that Dynamo had one in the break, but it explains why they shut everything down, the reason it wasn’t that obvious is that they were not shy in attacking the hills. And at one point Mike called James and I onto his wheel as he let rip up the hill (at this point the break had 2 mins, so it was certainly safe to try and get away and we wouldn’t catch them), I clung to his wheel, which was HARD, we got a small gap, but it was never enough. The race kept on going, and slowly the bunch was whittled down as each time up the hill someone set the pace, I tried quite hard to go with something, but my legs were aching, and nothing seemed to stick. Liam Maybank from Twickers had a good go off the front for a lap or so, and looked like he was always able to go with a move, so on the last lap when someone really hit the hill hard, I made sure to go with it, I was literally on the limit here, and I don’t think Mike would disagree when I say I think he was too, he waved me through as we were the back markers in the split, but I couldn’t, we got over just about, legs packed full of lactic, and it looked like we may have done the right thing as we sped down the fast downhill. However it soon ended the way many others had and it all came back together. With about 4 miles to go I knew it was just going to be a gallop up the hill and I sat in to try and save energy and give my legs one last smashing up the hill to try and race for 3rd place. It was maybe 1 mile to go as we approached the dead turn into the final hill, when I hit the pothole, the one that had killed off many people in the earlier race, initially I thought I’d got away with it, but about 10 seconds later the horrid realisation that I was riding on the rim on my rear wheel took hold, I put my hand up and slowly came to a halt, the noise and feel was horrific, I DID NOT want to be riding on a Zipp wheel with no air in the tyre. I eventually came to a stop and the bunch all went by. I was VERY annoyed, especially as I had missed the hole every other time and the last lap was the one that scuppered me, and so close to the finish too. But one thing I was glad of was to get a proper workout from it, I worked harder in that race by quite a margin than I did in the Milburys road race, and the powermeter tells me as much, 270 watts for 3 hours with numerous sprints out of corners and according to my data 40 minutes spent over 420 mins, which certainly gave my legs a kicking. It was an annoying outcome, but its been a good weekend of riding, and hopefully can go into the SE divisional champs with a bit of good form, I will need it just to stay in the bunch on that circuit! The Tour of the Milburys was a race I had been looking forward to for some time. I would almost go as far to say that it was of my target races, as I thought it would suit me well. The format of this race was different to the majority I’ve done, it was a 2 stage, 1 day race. The first event was a 6km uphill time-trial, followed by a 70 mile road race later in the afternoon. It was an interesting prospect as I knew that I could put in a fairly decent effort in the TT as despite it being billed as uphill, it was really quite a shallow incline after the initial ramp up, so it was TT bike friendly, and certainly suited me more than a straight hill climb where my weight would hurt me. The rolling nature of the road race wouldn’t be a hindrance to me either as there was nothing really steep, just gradual inclines. There were time bonuses on offer for the Road Stage, 3 seconds for winning the prime each lap, and 30 secs for the winner of the road race, 20 for 2nd, 10 for 3rd, so having looked at last year, the TT was really not the decider and in fact last year a break got away and obviously turned it upside down. Given the circuit it would be likely something similar would happen this year. I was doing the race with a clubmate (Aaron) who had been putting in some good results in circuit races but this was his first road race, so we got down there nice and early ready for our 10.45 ~ starts in the TT. The weather in the morning was great, but it was looking ominous for the rest of the day. There were a few riders names I knew, and there were a few clubs that were well represented (Dulwhich, Guernsey Velo, Exeter Un) so it would be a hard one to get right. Anyway, with a quick warm up done we headed round the corner to commence the TT, early reports were saying that the quick times were sub 10.40 (mostly done on TT bikes), so at least I had a goal in mind. Aaron went off shortly before me, and I lined up. I knew that for this sort of duration I could do around 400 watts, so that is about what I set off to do for the first couple of mins to keep it calm, and then just go as hard as I could for the remainder. I pushed off and quickly got up to speed, the course was nice, but it was a bit blowy up the top, and though it was mostly a tailwind, there were a couple of gusts that didn’t feel great with a disc wheel! I was around 5 mins in and power was looking good, and I felt like I was going well, I overcooked one of the corners slightly, but apart from that I was feeling good, about 8 mins in I could see my minute man ahead, and I kept going hard to try and make the pass, we came round the final bend and a long straight drag to the line, I went by the Peter Hansford rider and dug in hard for the line, stopping the clock at 10.20 or so (10.21 I was given), I was pretty spent initially, 408w was a best for that sort of duration and I felt it. But I was feeling confident about the time as I rolled back down to the HQ I was pondering how I may play it if that was the quickest time, but all that was fairly short lived when I got back and saw Rob Yeatman of Dream Cycling had put 9 or so seconds into me, putting me in 2nd overall. 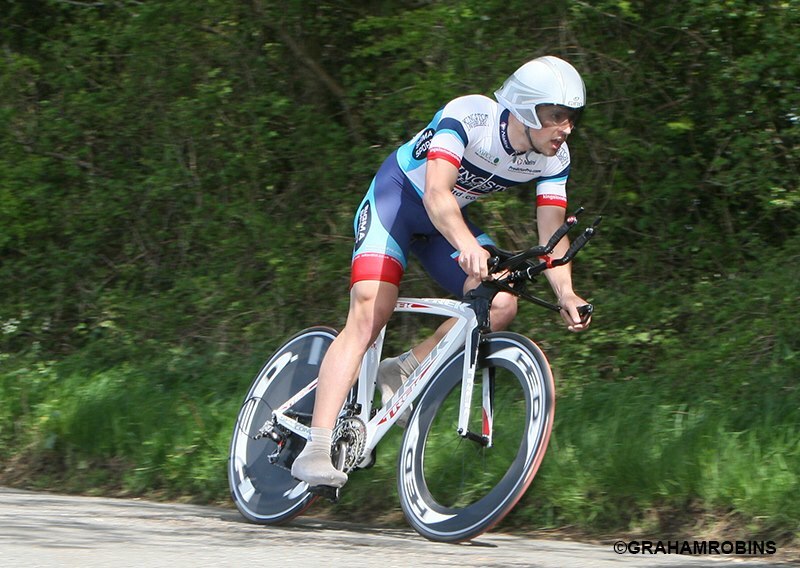 A quick google shows that Rob has some pedigree when it comes to Time Trialing and in fact was a junior national champ, that added to the fact he probably weighs less than 60kg meant that this course was probably pretty well ideal for him, so I wasn’t too upset to be beaten by him! The other thing about this is that I didn’t have the issue of being marked as much etc as I was 2nd as opposed to first. Aaron came in with a 10.55 I think, which was a strong time on a roadbike, as I reckon a TT bike bought me certainly 20 or so seconds on this course. We scoffed down some food and watched the weather deteriorate slowly as the afternoon approached. Joy. 1pm rolled around and it was line up in the car park time for the road race, we were to do 9 laps of the rolling course around the spectacular Meon Valley, as I said earlier, there were primes each lap with the top 3 riders getting 3 down to 1 seconds for winning each prime, so the potential of 27 seconds, and 30 seconds for winning the stage meant that it was literally open to anyone as even the slowest TT times were only 90 secs down on mine. We rolled out and it started to tip it down – not really an issue for me as when racing I don’t really feel the cold too badly and I am quite a confident descender and cornerer (a new word I’ve just invented) in the wet, but it did makes things a bit dodgy. Sure enough we were only 5 miles in and Wayne of Vicious Velo and another chap slid out on a corner a-la Wiggins in the Giro, they both got back up pretty sharpish, but it was a reminder that although you may be confident in the wet, others may well take you down if they overcook something! The race went on and I was just going with the moves, watching Rob, and also making note of anyone that looked strong, which is what Chris Zappala of Dulwich looked, he was a powerhouse in that race always driving, always at the front or near it and always looking dangerous. Lots of things tried to go but with no avail, and every time we went up the climb people were losing contact, I felt pretty good. On lap 2 or 3 a crash happened just before one of the corners and sadly Wayne went down pretty hard and ruined his rear mech etc, I think someone came across him, so sadly for him it was race over. It was around this point that a Dulwich rider, Chris Bedson, and Gray Tunnock of Finsbury Park CC got away, they opened up a fairly good lead, and were eventually joined by Andy Bryson of Peter Hansford, this was a fairly dangerous move, but I still thought it was too early, at the most they had a minute on us, but then the well drilled Guernsey boys, Chris Zap, and sometimes myself were doing turns to bring it back, and gradually we did. I was careful not to do too much as there was the lurking thought that it would end in a sprint so I didn’t want to be too ruined for that, especially as I had not managed to get any of the primes, as the sprints for them had been very chaotic and obviously the breakaway was mopping them up for a fair few laps. We came down to the bell lap and the pace hotted up a bit, it was clear at this point that people were suffering, and the rolling course was taking its toll (my legs felt pretty beat too now). As we headed into the last 4 miles of the lap, we hit the bottom of the long gradual climb (think the second section of Box Hill but for much longer) and 3 guys jumped away, I thought it looked good, but was in a crap position to go with it, and also I think had I gone at that moment I’d have taken the bunch with me and just knackered myself for no real reason. So I waited a bit, and encouraged other riders to do some through and off to bring it back given that only 3 riders were up there and many teams had nobody in it. I went to the front to do a turn and had a quick look back and I had a gap of a few bike lengths…This was not a situation you find yourself in often, so I thought sod it, it was now or never, so I drilled it up the hill and was getting a bigger and bigger gap, excellent I thought, this could be it, I looked back and one of the Guernsey guys had come with me, but was on the limit as far as I could tell, I waved him through, he didn’t, I waved him again, he didn’t. It was now I realized he had someone up the road, but as far as I was concerned we either worked together to improve both of our times, or we got caught and it was up in the air again, so he did give me a quick turn as I think he saw sense, we worked well on the downhills and I could tell I was going better than he was, and we were catching the leading 3. We passed by the 1km to go board and the 3 were 30 meters ahead, the bunch was maybe 10 seconds back, it was going to be tight, we made the bridge to the front three who started to look round, a bit of gentle encouragement to not look round and ride and we were on our way, I sat on for 25 secs or so and the line was in sight, at this point I came through to do my turn as the bunch were gaining on us, I felt good, and with maybe 200 or so meters to go I opened up a sprint from the front, I knew it was not the best idea to be leading it out, but I dug in and nobody was coming round me, my legs were in agony but I kept going, a quick shoulder check and I could see nobody was going to come round and I crossed the line, arms aloft to take the win! 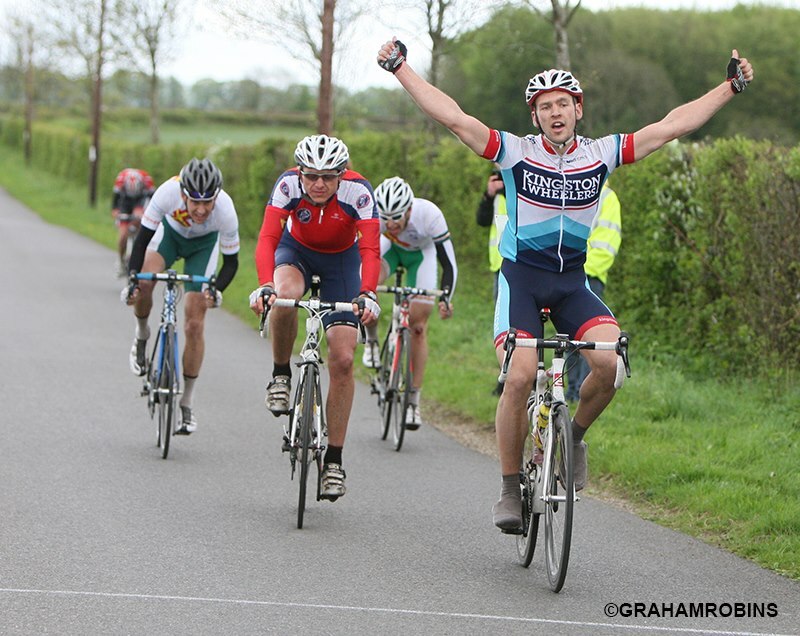 Bloody brilliant feeling, I knew at this point I’d likely won the overall with the 30 sec bonus the win gave me. After a quick chat we rolled back to the HQ (it was freezing by now) and waited around for the result, which took some time, I was careful not to start talking like I had won until it was confirmed, but everyone said it was probably a done deal, including Rob Yeatman who had finished in the bunch. Finally a spreadsheet went up on the projector and it was done, I had won by 32 seconds with Rob finishing in 2nd. I was over the moon! 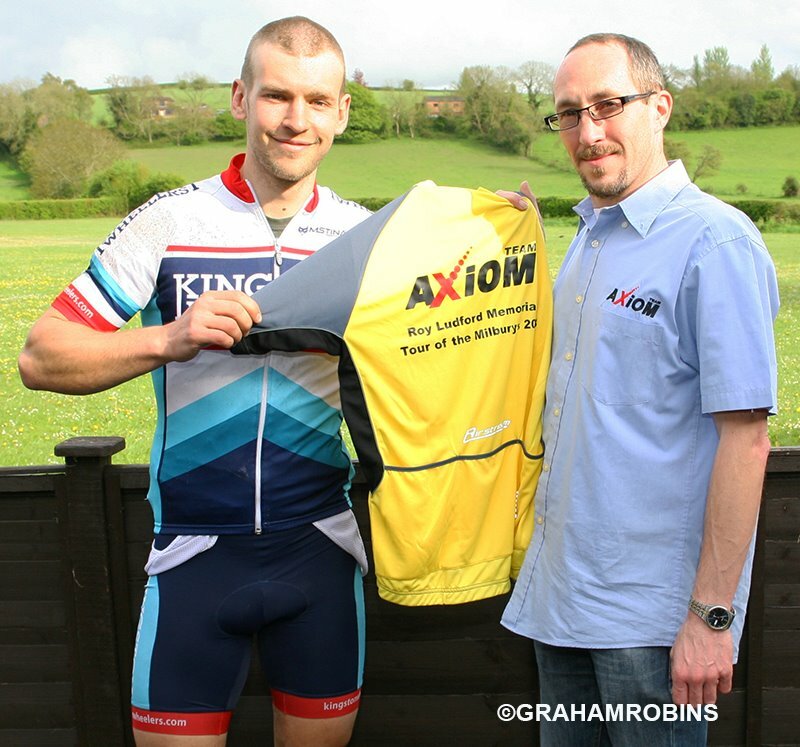 A quick presentation of the prizes, I did well out of this race having pocketed top cash prizes for the overall and the RR and 2nd in the TT, and was presented with the ‘yellow jersey’ courtesy of Team Axiom, who put on a great race and organised it very well. My best result to date, 48 points netted, and generally a great day that even the turd English weather couldn’t spoil! With the disappointing race of Saturday behind me, and a good pre race ride, I felt up for this TT. The weather was amazing, and the conditions according to those in the know were almost as good as it gets. The course is called F11/10 which is renowned as being one of the fastest 10 mile TT courses in the South, its on the A41 near Tring, and despite its A grade, it isn’t really that busy. The course is fast because it has a big hill in it that you don’t have to go back up, it does have an extra turn however to try and mitigate the ski slope. The first two miles from my recce in the car were going to be a struggle as the surface is really not very good, but after the first turn it gets much better and is pretty smooth the whole way to the end, thankfully the hill was free of hole! This was a fairly important event to me as it was one of the few times I had a spare day to do a fast 10 mile time in good weather. What’s more was that the club TT record holder Steve Irwin was riding. Steve has dominated the club records in his time with the club, and holds every distance short of the ultra long distance stuff (12 hr etc). In fact nobody has even really come close to challenging him in the last two seasons, and this is down to a few reasons really – A ) because he is bloody fast, and B) because the others with potential to challenge him had not really followed it up for various reasons, and really I suppose none of those few had gone the whole hog with the bike, pointy hat etc etc. But as you will know I obviously did, and bought most of it from the man himself. Today was 140 riders, and I was off number 12. Which was good and bad, good that I would be at home before the last guys went off, bad because I’d be at home when all the fast times were coming in. Also no matter how you word it, when you say to the event organizer that should your time end up being on of the fastest and would it be possible to post the prize – you sound like a helmet – so for those reasons I’d rather have gone off a bit later, but I should imagine that won’t be such an issue going forward. I started warming up, not that I needed to as my garmin was reading 25 deg! Being one of the first off I made my way up there and tried to keep cool. In my head I had worked out the average speed I needed to be at to 1. Go under 20 mins (over 30mph avg) and 2. Break the club record (19.20 set by Steve on v718 last year) which was 31.1 mph avg. I lined up and off I went, the first mile and a half are horrible, ruts and holes everywhere on the left hand side of the lane, I was actually hopping the front wheel every time to avoid hitting it with full impact and pinch flatting, this was almost certainly not the fastest way through, but my avg speed was still good, so at this point I wasn’t too bothered, I got through the first turn without being held up, and I was off down the other side, road still poor but certainly better, and then suddenly it all changes, the road becomes smooth. At this point you have a slight drag up past the finish before the hill, I looked down and my average was 29.5 mph, so I knew I was going well, I hit the downhill and quickly see why its a fast course…Before I know it I’m doing over 40 mph, things are starting to get a bit spinny as I only have a 53-11, then 45mph, and then I see 48mph on the speedo, which looking back at the data had me at 122 rpm, in the extensions, which is not ideal as that sort of cadence creates movement which is the last thing you want at nearly 50 mph. As the hills starts to shallow I settle back into my rhythm and keep it at high speed the whole way to the turn, 6 minutes/3.5 miles at 35mph infact, which feels amazing when you’re doing it. I get to the second turn and my average is 32mph annoyingly I get stuck behind a van who slows me down, but only by a couple of seconds. I know I am going well, I look down and can see that there is only 2 miles or so left, I start really digging in. But then the power meter cuts out (it has been doing it all race, probably due to the taped on magnet getting knocked about by the surface) again, and instead of back-peddling to try and re-engage it like I had done earlier on I just ignored it and pushed as hard as I could, it was really hurting at this point, I looked down and saw 18 mins, power was back and all I could see was a speed dipping below 30 and 400w, I dug in as hard as I could which was only around 400, it was all I could do, and the last 4 minutes looking at the file were at around 400w, there was a faint hope of doing an 18 but I could see the finish in the distance and knew I wouldn’t be able to make 18, but I was on for beating the club record, so I pushed and pushed and crossed the line in 19.13, shaving 7 secs from Steve’s existing record, I felt horrendous, and my spit was like glue, I put it in the smallest gear I had straight away and crawled back to the HQ. After a recent spate of elite races I was keen to come back to a 2/3 level of race and see if the beating I’d given myself in the likes of the Les Ingman had made a difference. In training rides etc I think it had. I think however I may have overdone it a bit during the week, not on volume as such, but just commuting each day seemed to have left me with dead legs by Friday, which the constant pulling away from lights (not to mention my commuter is stuck in the big ring and 20t – not ideal, must fix that!) and having the day book ended means that it does catch up with you. So actually on Saturday morning after trekking up to Cranfield I didn’t feel great. Still, I thought to myself that I’d felt worse than this before and pulled out a result, so what the hell. Now when I signed up for this race I thought it was a regular road race, albeit a short one at 40 odd miles. However what it turned out to be was almost a crit, round a 2 or so mile circuit, that had a bit of everything, downhill, cross wind section, and a very fast uphill with a stonking tailwind. We got told that lapped riders would be taken out, which was at least a sensible way of going about it on such a short circuit which was going to be fairly selective. Over the first couple of laps I tried to get near the front, various people were pinging off the front, I tried to join a couple of moves that got brought back, it seemed hard to get away, and really the best chance of doing so was up the hill, but it was clear that I didn’t have the legs to go full on and then nail it into the crosswind section, which is what it took to get the gap you needed. A few riders had got up the road, I had a chat with a mate and we said we would try something soon to see if we could get over, but I had a feeling he was going much better than me. It was about at this point that a young lad from Arbis started drilling it on the front, I was 3rd wheel behind a big bloke and I was doing 500 watts, this lad was hammering it, I couldn’t believe it, it smashed the group to bits behind, and actually briefly we managed to get get a gap without even realizing But it was all brought back, with 5 laps to go there were a couple of established groups up the road, and I was just wanting to go home, it had also started to rain. With 3 to go Ed came by and called me onto his wheel, we got away for a bit but through the crosswind section it wasn’t happening. So with two laps to go it was just going to be a normal run in, I was just going to roll in, but I didn’t know how many were up the road, so thought I’d give it a sprint just in case, before I go on I will say that the road was perfectly wide enough, and it was safe to sprint, I do not advocate sprinting for the minor places in most occasions, but this was a smallish bunch now and I had a clear run, we approached the line and I thought people were leaving it a bit late so I just went on the outside and ‘won’ the bunch kick by a few bike lengths, which at least offers some comfort that I can still sprint. Shame it wasn’t from the right group! Ironically my legs felt FAR better the next day after getting a proper nights kip, now I’m improving more slowly the little things are becoming more apparent, things like sleep – I must be getting old!! Results not out yet, but I suppose I’d be in top 20 somewhere, not really worth shouting about, hence its taken me 3 days to muster some enthusiasm to talk about it! However, a stage race in the Tour of Milburys this Saturday has me excited, not least because it has a 4 mile prologue to set the GC, but also because its down where I used to live and also I have a strong teammate coming with me too, should be fun. Then we’re doing a Surrey League 2/3 on the Sunday, so a GOOD night sleep Sat and I should be ready to go again on Sunday. Its only early season but I still worry about my results drying up despite my numbers being better!